You are currently browsing the Dublin Event Guide weblog archives for August, 2017. After my long weekend away last week, it is all back to normal again in the Dublin Event Guide HQ. That is a good thing and a bad thing. Last week was SUPER hectic and tiring and I felt that staying up all night for too many nights does have a direct impact on my eyesight. That is a frightening experience. So “normality” is an improvement on that side because I “only” stay work through one full night and get about 3 hours sleep the other night. But for you “normality” is bad because it means unfortunately that the Dublin Event Guide is out late again. Apologies! I am still working on finding the golden compromise. Plenty of events again this week so for the last week of school holidays you won’t be bored! Thanks for the support again last week. your support is sooo important! The great news is that all August bills are sorted and the amount needed for September is already reduced by EUR 50 to EUR 190. You can help via PayPal here even if you only have a few Euro, everything counts!! I have also added another way for donations if you prefer to use your credit card via GoFundMe here. This week the great Kathryn H, Ornaigh G and Eamonn U were so great to help with essential donations! Thank you so much! Your help is much needed and VERY much appreciated. Gerard Ph, Fiona F, Gabriel K, Aislinn T, Barry M, Trudi C, Eugene G, Marc F, Susan H, Grainne O’S, Edita M, Joan S, Daire OC, David P, Anne H, Irene C, Comet Records, John F, Daniel E, Olivia C, Nora O’K, Joan S, David O’K, Tara R, Keith Y, Valentina S, Clodagh O’C, Philip W, Nina J, Michael McS, Trevor J, Edmund G, Ann McP, Noelle H, Adrienne L, Michelle M, Stephen S, Darren McG, Jutta B-S, Geraldine R, Ciara L, Melanie B, Finbarr McG, Catherine E, Paula Ralph, Orla C, Amanda O, Catherine G, Arthur D, Moira dF, Juliana AY, Elaine K, Ann M, Mark G, Julie Anne O’B, Bridget W, Sean S, Karen A, Melanie M, Zelie McG, Lisa H, Tim O’N, Isidro G, Laura B, Shane M, Brian McG, Shai C, Margo C, Majella M, Tania Z, Barbara Q-B, Sueanne O’H, Cornelia K, Kevin R, Liz D, Amanda O, Carmel M, Sinead W, Julia B, Rebecca T, Margaret M, Kay G, Darragh D, Carmel C, Derek S, Clodagh O’C, Bernadette B, Ellen B, Cristina B, Breda K, Mary K, Siobhan M, Jan K, Sean O’C, Bernice McM, Raymond M, Henrieta P, Albert McC, Marion K, Barry McD, Oisin B, Rita B, Fiona R, Rachael McC, Tara R, John F, Yvonne K, Katie D (Paperbear), Celina V, Ali McD (Fitality), Catherine G, Catherine F, Dean R, Colum F, Fiona D, Aoife H, Nicola W, Mary C, Valerie W, Pauline R, Sophie P-L, Sinead NiC, Gerard K, Milena V, Richard P, James E, Valerie A, Susan B, Sharon K, Michelle McN, Anita W, Ciara T, Noel R, Bill G, Lisa C, Catherine O’S, Tim O’N, Michael McS, Adrienne L, Niamh O’C, Retrogaming.ie, Danijel S, Noelle H, Barry O’H, Marcus H, Brendan M, Eric F, Caoimhe Ni M, Daniel Le G, Gordon S, Deirdre C, Mark G, Aishling B, Ana R T, Ann Marie S, Gerard B, Luz McC, Nicola R, Caitriona D, Eva B, Ann C, Jutta B-S, Moira dF, Roisin R, Tracey O’C, Donna M, Jessica G, David S,Brendan R, Joan S, Stuart N, Filippo G, Gergory F, Mark C, Deidre M, Howard L, Paul R, Linda McD, Isidro G, Gemma O’N, Aoife M, Anita W, Mark R, Clodagh O’C, Niamh D, Odhran K, Belinda B, Eimear L, Brian R, Andrew G, Marta T, Linda C, Grainne F, Rita B, Rosemary K, Mary McK, Ger O’B, Alison J, Sinead L, Lesley C, Noel N, Majella M, Mona O’R, Leigh P, Eric C, Anette K D, Aoife G, Aidan C, George K, Rita B, Thomas G, Roy C, Jutta B-S, Lorna O’C, Aisling McK, Miriam L, Fergus O’T, Julia Sch, Helen B, Susan H, Paula R, Justin M, Tony B, Ross M, Daniel L, Susan F, Joan S, Rachel McG, John F, Ann Marie S, Melanie B, Magdalena H, Leigh Ph, Mark G, Joanne M, Louise F, Kathryn H, Ornaigh G, Eamonn U and Travel Agency “Project Travel” (www.project-travel.ie Ireland’s only Norway and Northern Lights Travel Experts), Arthur’s Pub (www.arthurspub.ie A classic Dublin old-style pub in 28 Thomas Street with a new and buzzing music venue that runs lots of events), the Speedfriending Ireland Meet-up Group (www.meetup.com/Events-Drinks-Talks-Dublin/) (Where you can meet lots of new people and make friends), the Birdcage Bakery & Cafe (www.facebook.com/BirdcageBakery An independent cafe and bakery in 23 Harcourt Road, Dublin 2), Cycling Campaign (www.dublincycling.ie), www.FlamencoIndalo.com (A group that supports and promotes the art of Flamenco in Ireland), www.oliviercornetgallery.com (An Art Gallery in 5 Cavendish Row), www.thepaulkanegallery.com (A great Art Gallery, on the search for a new venue), www.cfcp.ie (The Centre for Creative Practices is the the only arts centre in Ireland dedicated to connecting, integrating and promoting immigrant, experimental and emerging artists among the local arts scene and audiences). 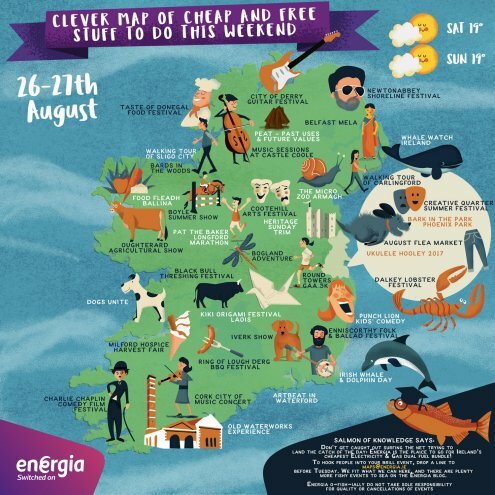 In a last “Hurrah!” there are lots of Family events this weekend before school starts again, so there is a Dublin Fun Day and a Blanchardstown Family Fun Day, but in addition the Merrion Square Open Day and the Ukulele Hooley and another Dublin Flea Market and the Dalkey Lobster Festival take place. Nw you have to decide where to go! A difficult decision! Some of you know that I am involved with the Gardiner Street Gospel Choir. I am looking after all Technical and Sound related matters and am also involved with the smooth running of the choir. The weekly mass will run from September until June and there will be some gigs in addition to the weekly “Gig in God’s Gaff”! Support is available to get the drummer up to speed (pun intended ;-) ) with all the repertoir. If you are a drummer and are interested or if you know somebody who might be interested, you or the drummer can contact me on dublineventguide@gmail.com with the subject DRUMMER. Please include a phone number so that I can ring back to discuss some details. The first mass after the summer break starts on 10 Sept, so the sooner our new drummer contacts me ;-) the better! Heritage Week 2017 – Last Weekend! Heritage Week 2017 is taking place this week from Monday 19 August and it will run until Sunday 27 August. It is a nationwide event organised by the Heritage Council and this year’s theme is “It’s in Your Nature!” and with that, the focus is on natural heritage in 2017. A huge proportion of the events is free and in Dublin and Dun Laoghaire there are hundreds of walks, workshops, guided tours, exhibitions, talks, performances and recitals. There are soo many that I can’t include them all, but I did my best to include a good number of them, but that good number was probably still less than 10%!! So the rest, you will have to check out in the guides below. Altogether you have more than 120 pages of events for this one week long festival. Unfortunately the Heritage Council still separates the events by boroughs, which is not very helpful and there is another problem. The last update to the PDF guides was made on 17 July. I am not 100% sure if you need a more up to date version of the events lists, but if you do then you rely on their search facility on the What’s On Page of the website and while the search options are good enough, the presentation of events afterwards with just 6 events per page is extremely cumbersome. Summer of Heritage 2017 in Dun Laoghaire-Rathdown – Last Weekend!! It is National Heritage Week 2017 from Monday 19 August until Sunday 27 August. There will be thousands of events nationwide and in Dublin you can expect a few hundred of them. Organiser is the Heritage Council and this year’s theme is “It’s in Your Nature!” with a focus on natural heritage. The Kilmainham-Inchicore Community Festival will take place this weekend and the main days are Saturday and Sunday. The full list of events can be seen on this poster. 21:00 The Ritz Brothers – TheatricalMusical performance in CIE Hall in Inchicore. On Merrion Square Open Day a number of buildings around Merrion Square will open their doors for visitors. Some have guided tours and then often booking is required, others let you have a look on your own. And in Merrion Square the Institute of Archaeologists of Ireland is running Archeofest to explain what Archaeologists do. The events are listed on the website below, but for the first year, the information is a lot more fragmented and a little more difficult to digest. It also seems that there are less participating organisations this year. Win a chance for you and your family to get a private tour of the Dead Zoo. Drop-in and draw your favourite animal to enter the competition. No booking required. For ages 8-14. On Sunday is Merrion Square Open Day and this event is part of it. The Emma Byrne Foundation is inviting to a Teddy Bears’ Picnic in St. Enda’s Park. There will be a Teddy Bear hospital, children’s yoga, face painting, Inni K will play Ukulele and you can bring your picnic. Admission is by donation for the Emmy Byrne Foundation, which is a cancer charity. On three Saturdays in August (12+19+26) Crampton Court will be transformed into a family fun area. Kids, adults and their pets can enjoy different activities, including live music with The Pale, Call The Dancers and Jambo Jambo, ballet classes, folk dancing classes, Scooby Box Doggie dancing competition, kids art and book corner. There will also free treats and eats. The event page below is for the first event and was seemingly noit updated since then, but it more or less still applies even if the date is wrong. The Dalkey Lobster Fest will take place from Thu 24 – Sun 27 August this year. There will be lots of lobster and other seafood, but also all sorts of other food choices from 20 restaurants & marquees. In addition there will be lots of music performances and a large amount of them are free. And at the weekend Castle Street in Dalkey will be closed to make more room for all visitors and a Kid’s Zone will ensure that your kids won’t be bored. Eid al-Adha, a big Muslim Holiday (see more details in the description of the Eid al-Adha event on Friday) will take place on Thursday and Friday and a Pre-Eid Bazaar will happen at the Mosque in Clonskeagh on Saturday from 12:00-19:00. At 12:00 and 15:00 a guided tour of the mosque will take place. Some parts of Dublin got fancy names in recent years. The Creative Quarter is one of them, it is the area from South WIlliam Street to George’s Street, but only between Lower Stephen’s Street and Exchequer Street. There is no higher concentration of “creative” businesses than in other areas, so it’s a purely marketing driven name. In that area with focus on Drury Street, Fade Street and South William Street, a “Creative Quarter Festival” will take place this weekend from 13:00-20:00 on Saturday and from 12:00-18:00 on Sunday. There will be live music, on-street cooking demonstrations, fashion shows, comedy (not free! ), pop up stalls from local businesses and an out-door movie screening. The movie screening on Saturday (18:00-20:00 – Willy Wonka and the Chocolate Factory (the orignal movie)) ) is sold out, but there is often an opportunity to get a lat minute place at events like that because people don’t make use of the free tickets that got if they have something “better” coming up. 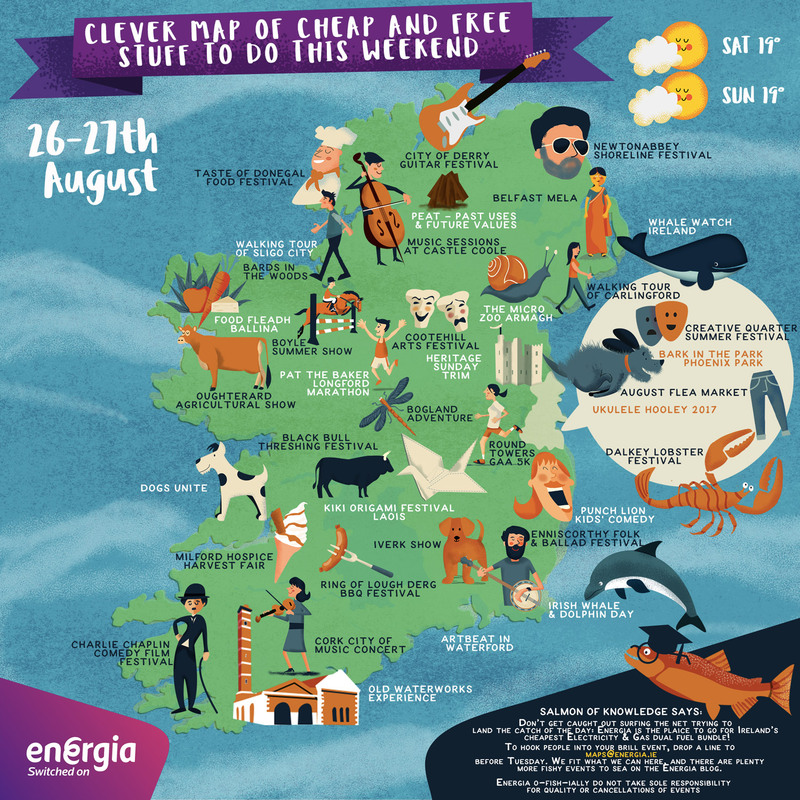 The complete schedule with timings and the names of the live music acts is on the website below. An outdoor Karaoke event, called Karaoquay!, is taking place at the Amphitheatre between Dublin City Council offices and Christ Church Cathedral. The Under the Sea event in teh Centre Mall (Level 2) will be an educational event for kids with lots of information about sea creatures provided by the people from the Seahorse Aquarium. There will also be face painting ad fish making. This year’s Harbour Roots Festival takes place in the Harbour Bar from Wednesday 23 – Sunday 27 August. A great line-up has been put together and all the gigs are listed below. The Bowery presents “ShipWrecked, a Nautical night of Rock, Rum & Dancing” with live bands GRAND, A Cult Called Man, Fever Solstice. Admission is free before 21:00 after 21:00 it is EUR 5. On the website it ALSO says that it is free before 23:00. I would go with the safer 21:00 option. TMFML presents Sister Ghost (Shannon Dolores O’Neill) with support from Chinese Newspaper and The False and the Fair. Cover band Rock Tribunal is playing a gig in the Porterhouse in Temple Bar. On Sunday the Dublin City Marathon will take place in and around Phoenix Park. It starts with a Swim in the Liffey at the Garda Boat Club on Chapelizod Road, this will be followed by the cycle in Phoenix Park and the third component is a run also in Phoenix Park. There is an Olympic Triathlon and a Sprint Triathlon option that athletes cab choose and the distances are Swim 1500m or 750m, Cycle 40km or 20km, Run 10km or 5km. This event is free if you want to watch it and support the runners. Transition area is on Chapelizod Road and that area is a good start to watch the event. The finish is also at the Garda Boat Club, so you will be able to see most in that area. Please note: Phoenix Park will be more or less closed for all traffic until 12:00. Tim Clabon from the Irish Wildlife Trust will bring you Otter Spotting at the river Dodder. It is a walk from the Dropping Well pub to Rathfarnham Bridge while keeping an eye out for otters and also looking for insects, birds, fish and the special flora of the river. The movie screening and the non-free comedy only took place on Saturday. Dublin City runs a Family Fun Day this weekend as a last celebration of the summer holidays before school is back. The Dublin Fun Fest will provide Kiddies’s Decathlon, Inflatable Games, Street Games, Face Painting, Dance Performances, Sports Performances and Food Stalls. At 16:00 a Ukulele Jam will take place when every Ukulele player in the audience is invited to play along. A song list was available on the website but is unreachable at the time of writing this. There is hope though that it will work again at some stage. The People’s Park Sunday Market is happening there at the same time, so that you won’t have to worry about food. On Sunday the Harbour Bar will host a Brazil Day with music, crafts and food and the full programme is (in Portuguese) on the Facebook event page below. An Intercultural Tour in Japanese Language with Community Ambassador Hiromi Anzai will take place. Meeting point in the atrium of the Library. The Blanchardstown Free Family Fun Day is organised by Fingal County Council and takes place on Sunday from 14:00-18:00 in Millennium Park. There will be lots of free entertainment, bouncy castles, face painting, games, magic, art& crafts, crazy golf, superslides, obstacle course and more. It’s the last Fingal County Council event of the summer before school is back. The brass band “Arklow Shipping Silver Band” will be playing a 2 hour concert in the Bandstand in the gardens of Farmleigh House. This is an afternoon of live music featuring koto, the Japanese zither, and shakuhachi, the Japanese bamboo flute. Listen to the music of the Edo period, including arrangements inspired by Turlough O’Carolin and 20th century melodies. This performance celebrates the Heritage Week and marks the end of The Art of Friendship: Japanese Surimono Prints. The animal charity “The Blue Cross” is running their last Bark in the Park event this year on Sunday in Phoenix Park. This event is a sponsored walk starting near the Papal Cross and it requires registration, but you can still register on the day and give donation there and then. In addition to the walk there will be a a raffle, music, goody bags and prizes for the dog with the Best Bark, Shiniest Coat, Happiest Smileand Waggiest Tail. Admission is not free, but based on a donation and if you just want to see lots of cute dogs and don’t want to bring your own then I guess your presence there is free. According to designer Alexander McQueen ‘There is no better designer than nature’ Join Sasha Sykes and other designers at the Museum to hear how nature inspires their practice. Admission is free. No booking required but places are allocated on a first come first served basis. Suitable for adults. “The Tiny Quartet are an instrumental group that put a jazz and balkan twist on some of your favourite pop, rock and folk tunes, from the last few decades.” They will play a gig on Sunday. The Chester Beatty Library is running a series of interactive tours specially designed for people living with dementia and their loved ones. Doing Interviews Intelligently – Business Library Talk. “Doing Interviews Intelligently” is a talk by Carmel Morrissey (Career and Performance Coach). The last episode of “Games ot Thrones” will be screened in the Bowery. This will be followed by a Games of Thrones Table Quiz with prizes and there will also be a fancy dress competition. A pop-up talk will happen in front of the painting The Penitent Magdalene by Bartolomé Esteban Murillo in Room 42. Orla Casey will give the talk. The Trad Session called “Call the Dancers” will take place and no other than well known musicians Ronan Ó Snodaigh, Eoin Dillon & friends will perform. This week’s Phoenix Park Walk is taking place in the People’s Garden and is a walking tour with OPW gardeners. Meet at the Parkgate Street entrance to the People’s Garden. St John’s College Chapel and Girls’ Choir and Orchestra from Southsea will be performing a concert in St. Ann’s Church. The programme will be a mix of classical and well known pieces with performances by: The College orchestra, The Chapel and Girls’ Choir, a Trumpet solo, a Flute Solo and a Choral Quartet. Admission is free. Donations are appreciated after the concert. The Temple Bar “Night” Market is more an afternoon and evening market (14:00-20:00) and it takes place every Wednesday until September. This is possibly the last market this year, but the website is not so clear on that! “The Clontarf and Marino Allotments of 1917 – a war-time food supply initiative” is a Heritage Week talk by Noel Carolan. The play “Katie Roche” by Teresa Deevy’s will start with a free preview on Wednesday. The event was oiginally planned for Saturday 26 Aug, but had to be postponed because some technical equipment was broken. The play will be on show from 26 August until 23 September. Tickets for the free preview will be handed out at the theatre on the evening of the performance on a first come, first served basis. I am not sure when the ticket desk opens but I would try to be there by 18:00-18:30 and I expect long queues. The bikes can be rented for free for up to 1 hour on Fridays, Saturday and Sunday between 12:30 and 16:00. The rules and conditions are on the website below and that is also where you book the bikes. In the lunchtime talk series “Library Matters”, the talk “The transformative impact of the new library building at Maynooth University” will take place on Thursday in the Seminar Room. Speaker will be Cathal McCauley, University Librarian, Maynooth University. “Nature as we imagine it” is a talk by Massimiano Bucchi (Università di Trento). The Irish Patents office will be in the Central Library to advise on “Protect your Business Ideas”. Find out how to protect your business ideas, how to apply for your rights, the costs involved and protection abroad. Learn about patents for inventions, registered designs for product shape/form, trademarks for logo protection and copyright law to help progress your business ideas. The Crystal Skull Sessions is a band competition in Sin É on Thursday. Natty Wailer and The Reggae Vibes will play a Reggae gig in the Harbour Bar. The next Cabin Sessions will happen on Thursday with the full Cabin Crew and special guests with special guests Paul Hennessy, Jackie Hennessy and Emma Butler. It is a night of roots, trad and Americana music. This is a full-day conference about “Women and the Irish Revolution 1917-23: Feminism, Violence, Nationalism” organised by Prof Linda Connolly from Maynooth University. Find all details and register via the link below. Admission is free. Eid al-Adha, the Feast of the Sacrifice, is the second of two Muslim holidays celebrated worldwide each year and it is considered the holier one of the two. The other one is Eid al-Fitr and it marks the end of Ramadam. Eid al-Adha will take place on 01 September and the Islamic Foundation of Ireland (IFI) is inviting to their celebration in the Iveagh Grounds in Crumlin, Dublin 12 (across the AIB bank on Crumlin Road). Parking on the grounds is EUR 2 per day and busses 27, 56a, 77a and 151 will get you there. The day will start with two Eid prayers at 08:30 and 09:30. Then at 10:30 Tea, Coffee and sweets will be served and at 11:30 kids will get a goody bag (first come first serve basis). From 12:00-17:00 a family day will take place with food stalls and other goods on sale and games for kids (trampoline, bull and bouncy castle). At 13:45 a Zohor prayer will happen. The new Whelan’s Trad & Folk Festival will take place from Friday until Sunday (01 Sept-03 Sept). The line-up is still being put together and therefore we don’t know yet who will be on stage over the weekend. The promise though is that there will be more than 20 acts on 3 stages and some of the headliners are already booked and they are Kila, I Draw Slow, Jiggy, Kern. Check the link below closer to Friday to find out the line-up. “Autumn Sounds with Duo Chagall” are two concerts in Farmleigh House that focus mainly on chamber music of the German composer Robert Schumann. Duo Chagall are Gillian Williams and Arun Rao and they are supported by inernational artists Arisa Fujita (violin), Pablo Manjon (Clarinet), David Agnew (Oboe), David O’Doherty (violin) and Lance Coburn (Piano). The concerts will take place on 08 and 15 September and the details are on the website below. Admission is free, but tickets will be allocated through a lottery and the deadline for ticket applications is 17:00 on Monday 28 August. To apply send an email to farmleighinfo@opw.ie with subject “Autumn Sounds Friday 8th September” or “Autmun Sounds Friday 15th September”. Winners will be chosen by lottery and will receive 2 free tickets. Only winners will be notified! This month, the walks will be on 12+16+26 August. One of the biggest Boxing Fights … or just a scam? On Saturday night/Sunday morning at around 05:00 a boxing fight will happen that is seen by some as the biggest boxing fight of the last 100 years or maybe of the boxing sport ever and for others it is just a big scam! Your opinion probably depends on who you support McGregor, Mayweather or neither of the two and how much you have looked into the fight. One thing is (quite) certain, there will be two human beings who will bash each others head in for their OWN enrichment. This is not an Ireland vs USA fight and it is also not a fight of Mayweather against McGregor or of MMA against the Boxing sport. It is also not a fight where either Floyd Mayweather OR Conor McGregor will win. No, the fight is a show that will make both opponents and their management a LOT richer than they are at the moment. McGregor is expected to get about 100mio and Mayweather will probably get from 300-400mio. Yes, the association of ringside physicians is VERY worried about the fight and severe damage of one or both opponents is possible, but I guess that’s not much different than at other fights and both seem to be happy to sacrifice their health for that crazy amount of money. So all this weighs down on the “scam” side of the argument. What about the two opponents? They both come across like egocentric, arrogant, brain-dead a**holes, but McGregor’s idiotic behaviour at the press conferences, his constant swearing and his seemingly out-of-control fits make him the much less likeable fighter. Surprisingly though he seems to have a lot of support in Ireland and the UK if the press conferences are anything to go by, but I am not sure he cares. Maybe it is because he is the definite underdog but apart from that he has done nothing to endear himself to his fans as far as I can see. For me he represents the negativity of our society. He might be super smart and very clever but he hides that so well behind his insane posturing and peacocking that we have to wonder if maybe his smartness is the facade and not the insanity? There are two camps in Ireland at the moment it seems. There are the people who LOVE McGregor and want him to win to “f*ck the Mayweathers”. And then there are the others who think the little wannabe McGregor should be taught a lesson and get a nice beating. Both sides clearly fell for the facade and pretense that surrounds this whole fight and both sides are needed to drive sales and to get the opponents to laugh their way to the bank. So in the end it seems the audience is being scammed and the two opponents are the really smart ones. Like at WWE (World Wrestling), we are the real dupes. Makes you wonder if maybe the outcome of the fight is also staged and – like in WWE – already known to the opponents?